January 22, 2011. 1 Comments. Categories Appetizers, Favorites, Soups, Vegetarian. Tags best tomato soup, san marzano tomato soup, san marzano tomatoes, soup recipes, tomato basil soup, tomato recipes, tomato soup recipe. Being the friend of a food blogger has it’s benefits…. but it sometimes has a price of not being able to dig into the food right away. Many times I’ll be in the middle of serving food and will think “I should really put this recipe on the blog…” I grab the camera and instruct the famished friend to just wait a couple seconds while I snap a photo. This lack of preparation also means zero uh… “food-styling.” So there won’t be any calls from Bon Appetit to use this photo. … I’m sure of it. Photos aside, this is very delicious soup. In Boulder, we have two restaurants on the same city block that both serve outrageously good tomato soup – The Kitchen Cafe and SALT the Bistro. My office used to be right next to them in the heart of a culinary plethora of lunch hot spots. If you’re ever in Boulder, both of these restaurants should be on your “must dine” list. This recipe was given to me by one of the managers of The Kitchen. You can also find it on their website along with many other popular recipes. I love that they are so generous with sharing recipes. I modified it slightly… but not much as it’s probably perfect as written. It’s creamy but has a very strong tomato taste that will make you yearn for summer months. As with most good tomato soup recipes, they recommend San Marzano Tomatoes. If you haven’t discovered San Marzanos then prepare to elevate anything you prepare with tomatoes. I won’t buy any other canned tomato. Buy a can at your local grocer and you’ll see why. 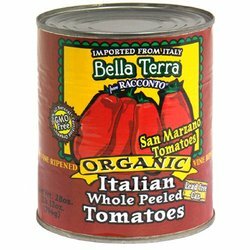 An open can of San Marzano’s will fill your kitchen with an intoxicating tomato fragrance. I use the Bella Terra brand which I find at my local Whole Foods. San Marzano’s grow near the city of San Marzano in the shadows of Mount Vesuvius. Legends claim that the first tomato seed was given to the King of Naples by the King of Peru in the 1770’s. This is probably not exactly true, but it seems a fitting tale for this royal plum tomato. The story of origin and how they cultivate and harvest these tomatoes is fascinating. The seeds were planted near Mount Vesuvius and over the years were crossed and cultivated into what we can buy today. The City of Naples calls for these tomatoes in their world famous Neapolitan style pizza that is considered the undisputed best pizza in the world. When you look for them, be sure you buy the certified organic variety. There are some impostors on the shelves. Look for a DOP label which guarantees you’re buying the real thing. Whenever I am making a tomato sauce of any kind – I reach for a can of these wonderful little immigrants from Italy. 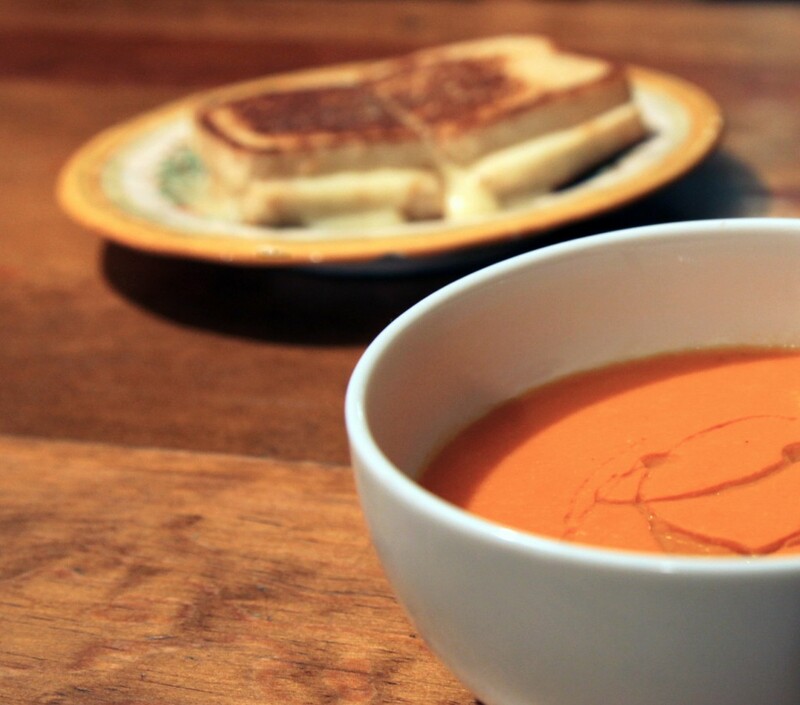 You can’t have tomato soup without grilled cheese. At Salt Bistro, they make a tiny grilled cheese “crouton” using goat cheese and place it in the soup. It’s a heavenly bite. Any grilled cheese accompanies this nicely but I would lean towards Gruyere or goat cheese on grilled sourdough bread. This recipe is definitely an indulgence. It has butter, cream and with a grilled cheese… you get the picture. Did I mention the drizzle of olive oil to finish it? But on these cold winter days I think we all deserve to indulge a little bit. Serve very hot. I poured the soup back into the original pot (after I rinsed it out) and heated it a little more before I served it. Drizzle a little olive oil on the surface. SALT the Bistro uses a basil oil on theirs..